Minnesota Gov. 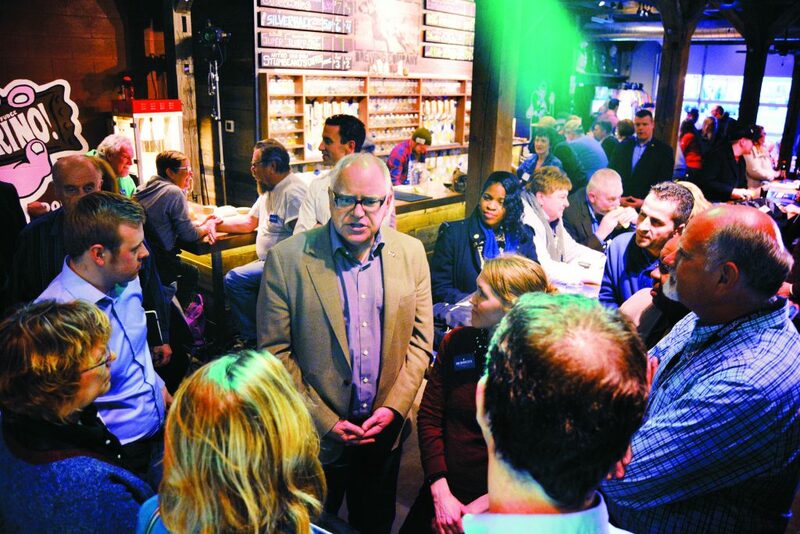 Tim Walz chatted with Moorhead residents and leaders Monday night at Junkyard Brewing Company as he and Lt. Gov. Peggy Flanagan brought their inaugural celebration to the Red River Valley. The “One Minnesota, 2019 Inaugural Celebration” drew hundreds to the north Moorhead hangout. It was the final stop of the weeklong festivities, during which Walz and Flanagan also stopped in the Greater Minnesota cities of Mankato and Duluth. He emphasized that he is not just going to be governor for those who voted for him, but for all the citizens of the state, regardless of party affiliation. With the DFL in control of the State House and governor’s office and the Republicans in charge of the State Senate, Walz said, Minnesota can be example for the nation of how the two parties can work together for positive change. Before Walz spoke, Flanagan told The Extra that “One Minnesota” is not just a slogan, but rather will be a governing style. “This inaugural celebration is a way for us to say ‘thank you’ and strengthen relationships with folks across Minnesota,” she said. Moorhead’s new mayor Johnathan Judd said it’s an honor and a privilege to have Walz and Flanagan visit town. It’s pretty cool to have this kind of event at a Moorhead business, said Clay County Commissioner Jenny Mongeau. “It’s really exciting that (Walz) has made such a commitment to reach out to outstate Minnesota,” she said. Moorhead High School senior Courtney Rix, 17, decided to come to the event with her mother even though she wasn’t old enough to cast a vote for governor. “Even though I can’t vote yet, I think it’s important to at least know what’s going on,” Rix said.